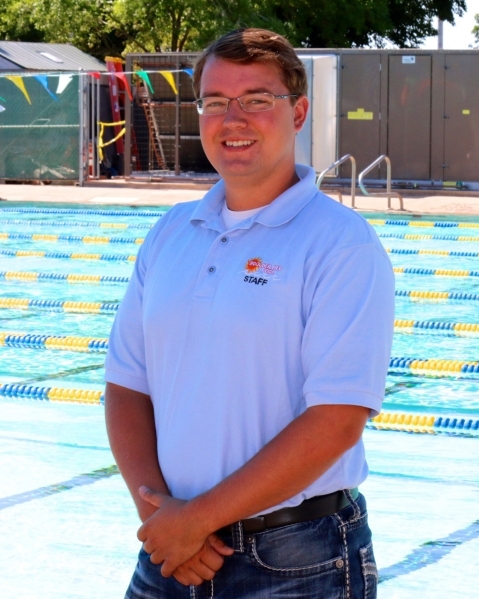 Jacob Andersen hasn’t been in Boulder City long, but that hasn’t stopped him from trying to improve the city’s municipal pool. Andersen, 28, was tabbed as the pool’s interim aquatics coordinator after former coordinator Sheri O’Berto resigned in the middle of July. O’Berto, who spent the past seven years as the pool’s aquatics coordinator, left so she could go back to school, according to Parks and Recreation Director Roger Hall. Andersen, who hails from small-town Iowa, was hired in December as the replacement for longtime assistant aquatics coordinator Bobbe Wilson, who retired in January. His job mostly consisted of filling out paperwork, interacting with customers and budgeting. Now, eight months later, Andersen is the pool’s head honcho. And though the word “interim” is still part of his title, it hasn’t prevented him from wanted to make big plans for the pool’s future. Hall said five people interviewed for the aquatics coordinator position, including Andersen. He expects to fill the position by the beginning of the week. Before moving to Las Vegas in February 2014, Andersen ran a recreation department in Kalona, Iowa, a small town with a population of about 2,300 located 30 minutes from Iowa City, Iowa. Though his Boulder City job is similar to the one he had in Kalona, Andersen said the Boulder City pool is much more challenging. Andersen said he’s gotten plenty of help from his staff during the past three weeks as he’s tried to gain a grip on what he described as a more “labor-intensive” job. He previously spearheaded the installation of the pool’s new heater while serving as assistant aquatics coordinator, and he wants to make updates to the pool’s lobby. “It’s a steep learning curve,” he said. Andersen is now making schedules, running programs and mapping out future ideas for the pool as he tries to drop the “interim” tag from his title. He said the main problem hindering the pool is its size, citing that it’s at maximum capacity for the amount of programs it can host. He said he wants the Boulder City pool to look more like the other pools across Clark County, including the addition of slides, diving boards and the ability to host competitions. “Our open swim usage would go up if we had some more space and amenities,” he said. Contact reporter Steven Slivka at sslivka@bouldercityreview.com or 702-586-9401. Follow him on Twitter @StevenSlivka.